21st Annual Collaborating for a Cure @ Cipriani Wallstreet. 6:30 pm Cocktails, Dinner, and Live Auction. 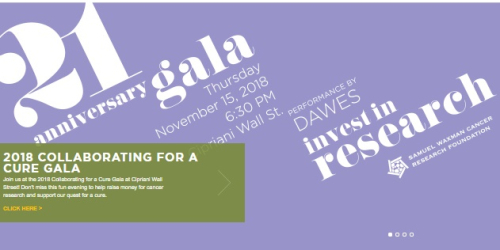 The Samuel Waxman Cancer Research Foundation (SWCRF) will celebrate the 21st anniversary of the Collaborating for a Cure Benefit Dinner & Auction on Thursday, November 15, 2018 at Cipriani Wall Street. The annual gala is well attended with typically 1,200 corporate executives, board members and their guests supporting the SWCRF “Invest in Research” efforts to raise funds that support highly collaborative research projects focused on eradicating cancer. The Collaborating for a Cure gala is among the top fundraising events in New York City, and this year’s much anticipated headline performance will feature rock band, Dawes.